E-bike ride through the spectacular Czech countryside on your way to the 650 year old Karlstejn Castle. Enjoy the ride through the Czech countryside to Karlstej Castle on electric bikes. 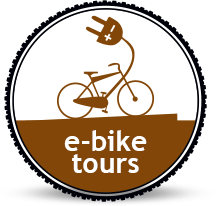 E-bikes make covering the 35 km trip to Karlstejn easy and enjoyable. Our Karlstejn Castle Bike Tour rolls you southwest of Prague along the Vltava and Berounka Rivers and through the Czech countryside to the gothic fortress built by King Karel IV to house the imperial jewels and his collection of holy relics. Karlstejn Castle, with its enchanting, monumental architecture is one of the most-visited castles in the country . We return back to Prague by train. Trains depart from Karlstejn to Prague approx every 30 min with the journey lasting 40 min. Our trip ends at the Praha Bike office around 17:30. For the whole trip you will be accompanied with our friendly and very helpful tour guide.